Hi everyone! 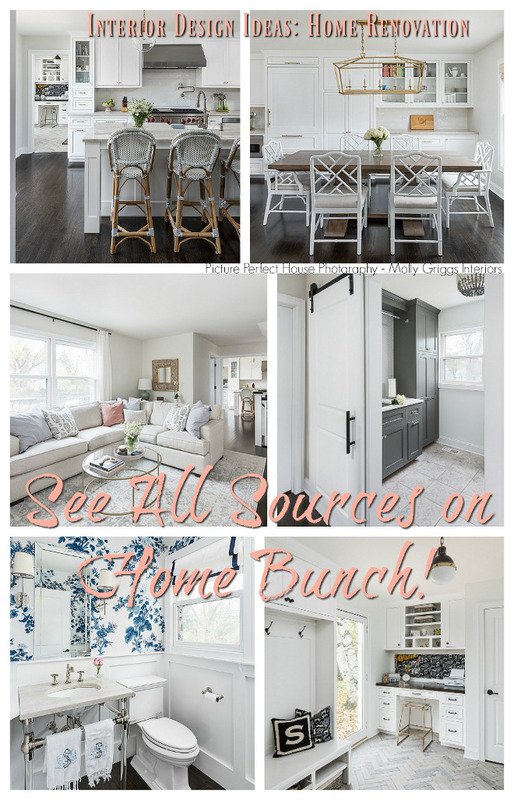 How great it is to have you on the blog today! It seems that this week flew by. Do you feel the same way? In fact, the entire month went by so fast…. but I won’t complain about that. 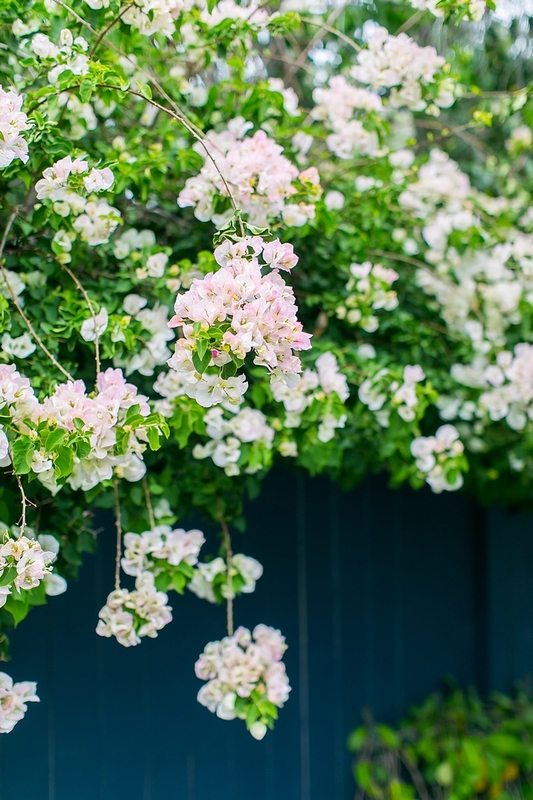 I am grateful that spring has arrived after a very long and cold winter. 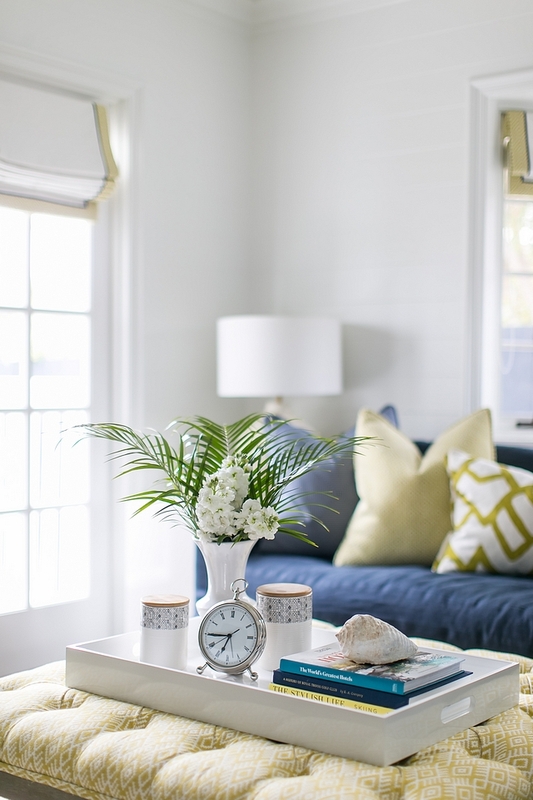 Talking about spring and warmer months, this new “Interior Design Ideas” has a very summery feel thanks to the colourful coastal interiors this home features. 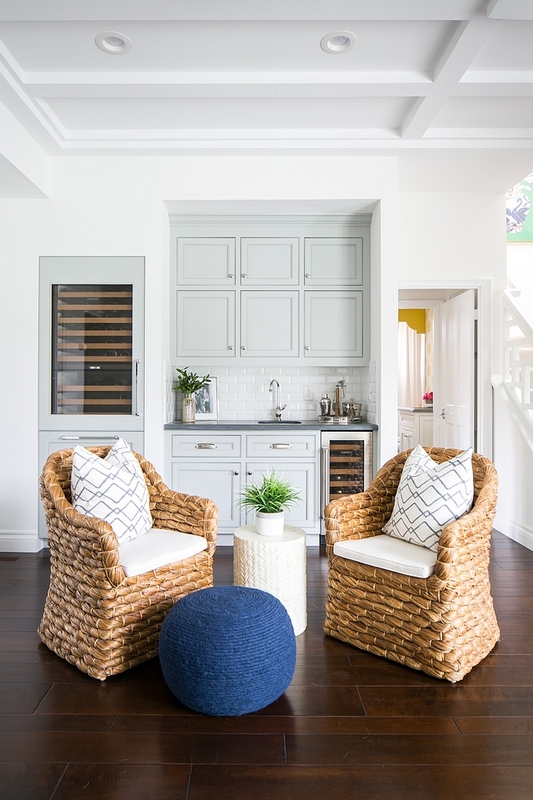 Designed by the talented designers at AGK Design Studio (previously featured on Home Bunch: California New-Construction Custom Home), this La Jolla, California home will make you leave the blog feeling happy, inspired and ready for the weekend. It’s almost as if you can feel the sun shining throughout these beautiful colors and the sunny backyard you will find at the end of the post. Find a comfy chair and dream away!!! Magazine-ready? You betcha! This home features classic archiectural details with some innovative ideas. How gorgeous is this home?! Take a look at the portico concrete steps. They look as if they’re floating. I love this idea! Containers: Frontgate 27″ – similar here & here. Wreath: here & here – similar. The furniture layout is perfect for a room of this width. 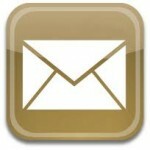 It feels comfortable and inviting without being cluttered. 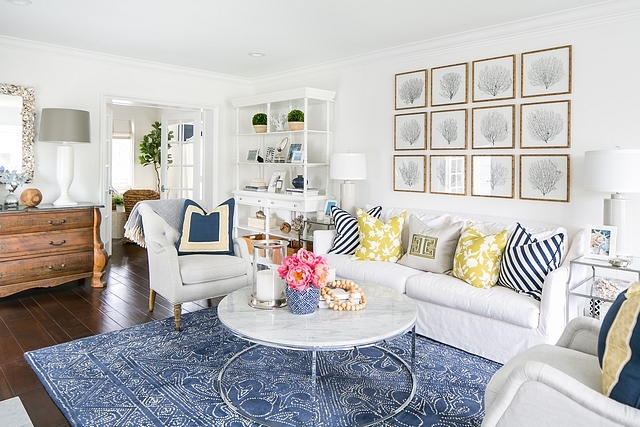 There’s plenty of space for walking around, which is something you must keep in mind when designing a living room. Sofa is custom, from Lee Idustries (available through the designer). Other Beautiful Sofas: here, here & here. 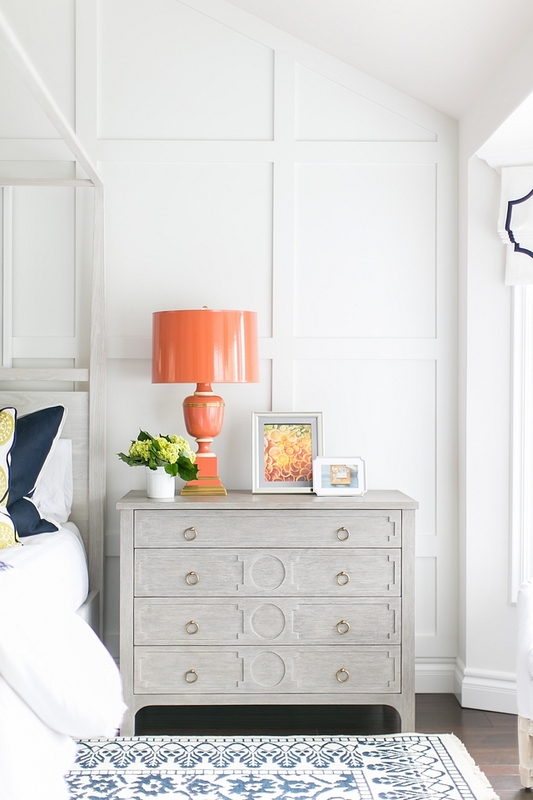 Paint Color: Sherwin Williams SW 7005 Pure White. 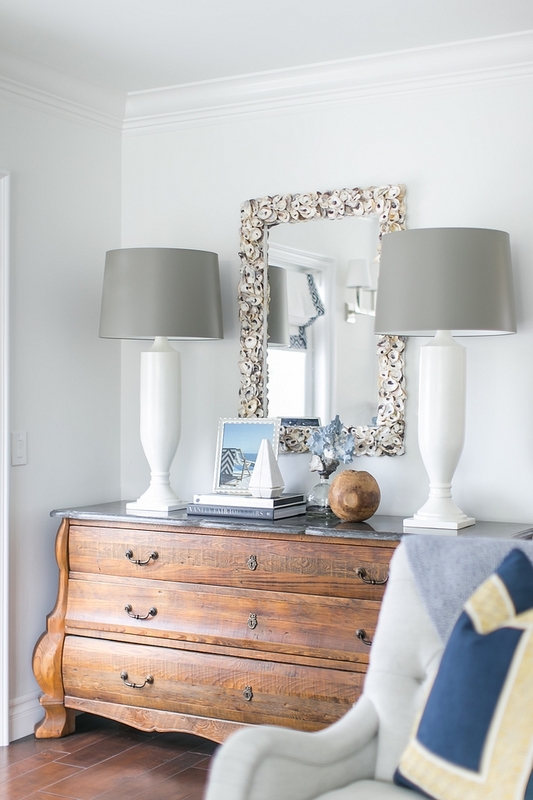 Lamps by sofa: Bungalow 5 Formosa Table Lamp – Others: here & here. Rug: Serena & Lily – (also available in runner size). 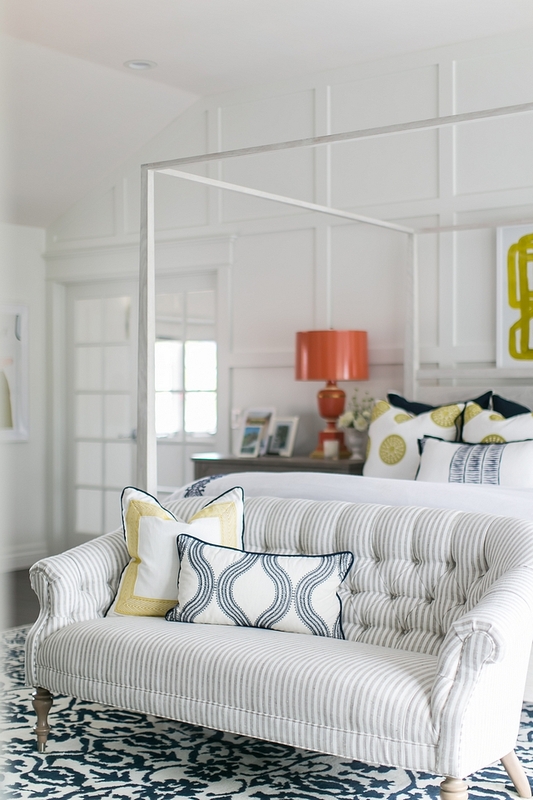 Pillows: Middle Pillow: Ryan Studio – Striped Pillow: Ralph Lauren (similar here). Art: Mirror Image Home – also available here. 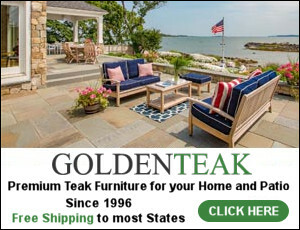 Coffee table: CB2 – similar here (in marble + brass). 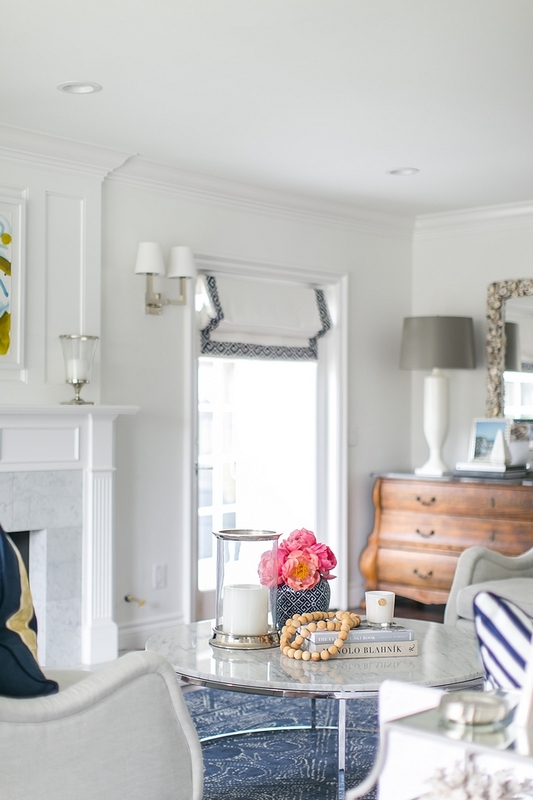 The coffee table decor carries the same coastal/feminine theme. 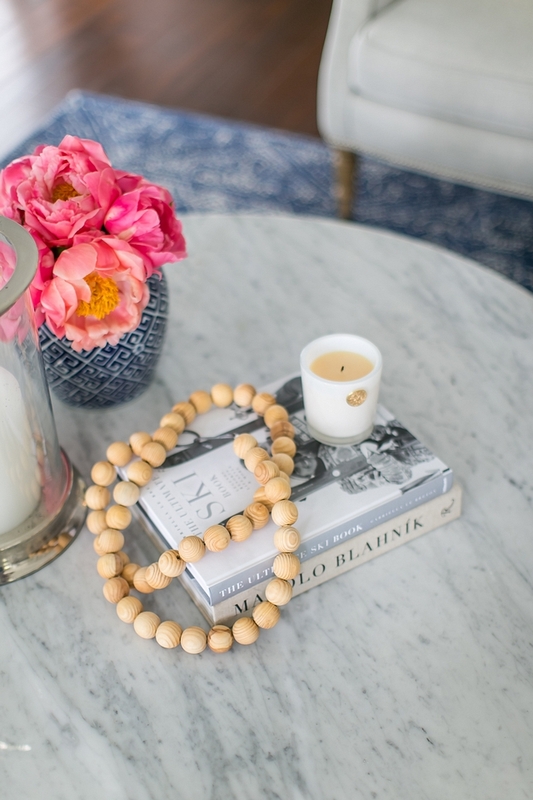 Similar: Wooden Beads, Greek Key Ginger Jar Vase, Candle, Books & Hurricane. Chairs is Lee Industries, custom – available through the designer – Others: here, here, here, here & here. Throw: here & here – similar. Lamps are Barbara Cosgrove (available through designer) – Other Tall Lamps: here, here & here. Shell Mirror: Modish – here. This large bombé chest already belonged to the client. Isn’t it a gorgeous piece of furniture?! Notice the stone top. Beautiful Bombé-style Chests: here, here & here. 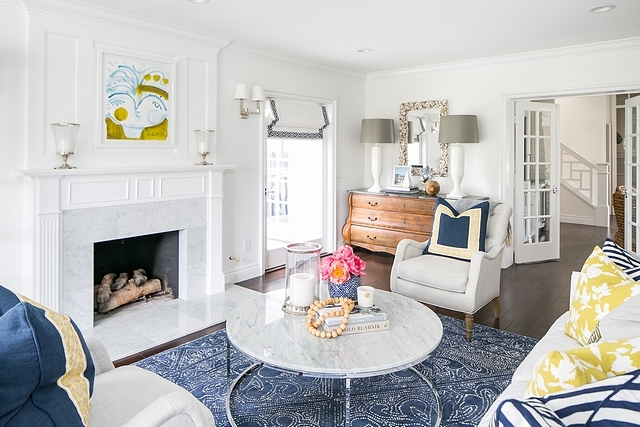 A white étagère with coastal decor adds personality to this living room. Similar Étagères: here & here. 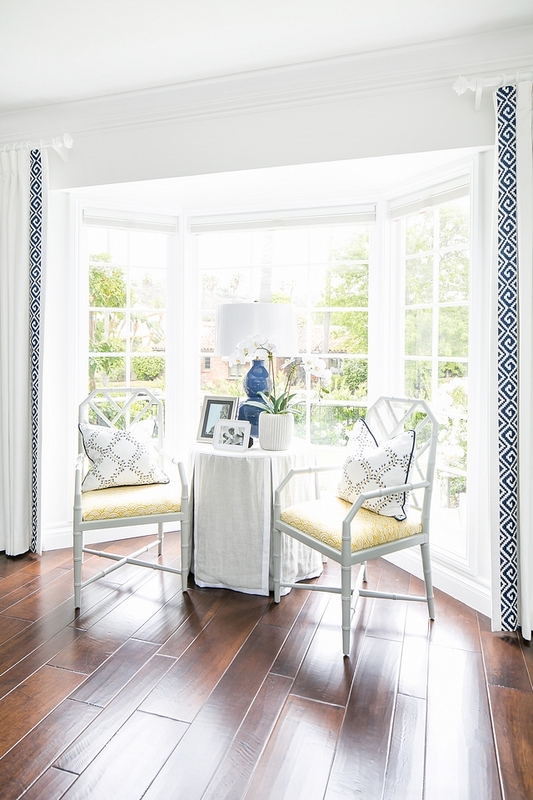 It’s always trick to design a room with bay windows. 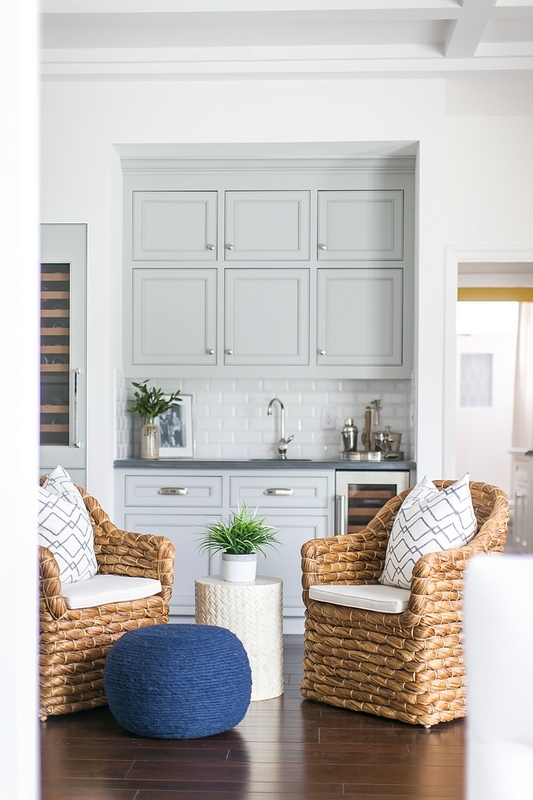 The designers at AGK Design Studio, smartly added a charming sitting area to this space. 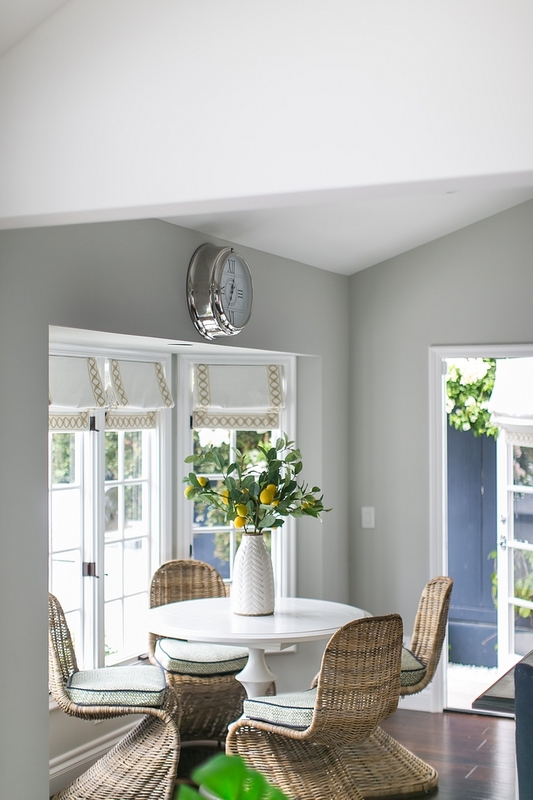 Chairs: Bungalow 5 in Gray – similar here. Custom Chair Seat Cushion Fabric: Duralee Lulu DK Bungalow/65. Table: Custom – similar here. Lamp: here & here – similar. 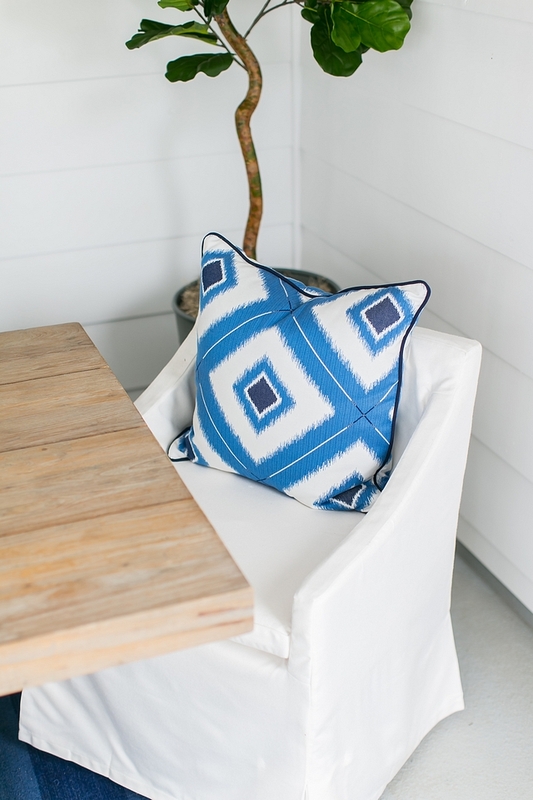 Pillows: Podcast Delft by Maxwell Fabric with navy welt (custom) – Other Beautiful Pillows: here, here, here, here, here & here. 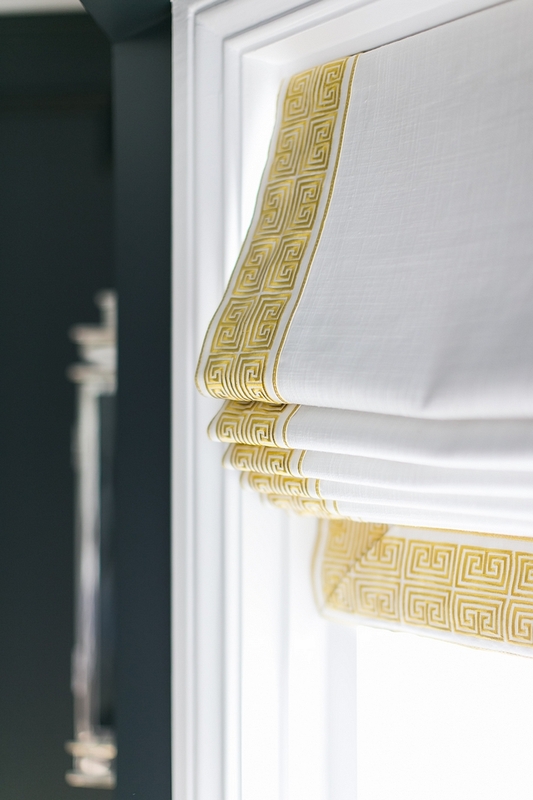 Drapery: Custom in White Linen – similar here & here. 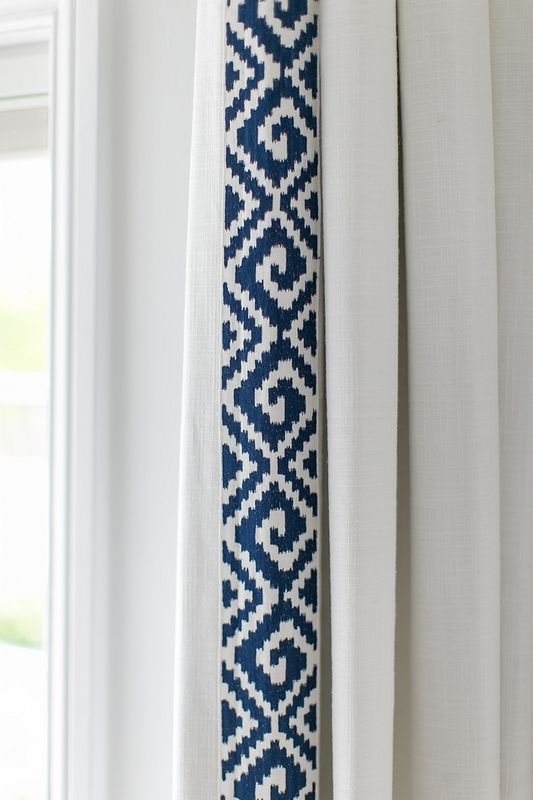 Taping on Drapery: Schumacher Fillmore Tape in Blue. This dramatic dining room is sure to impress! How fun it is to think outside the box and create a space that is original! 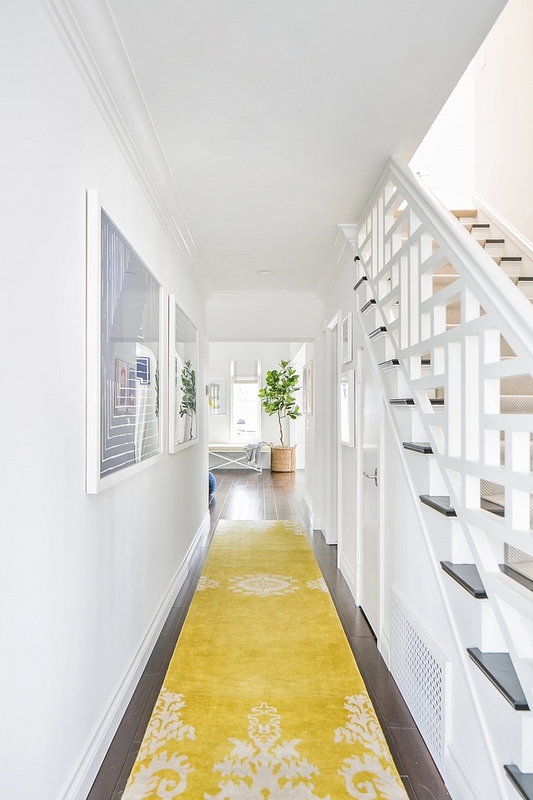 Rug: AJA custom rug (available through the designer) – Other Beautiful Yellow Rugs: here, here, here, here & here. Table: Charlotte & Ivy – similar here, here, here & here. Beautiful Vases: here & here– Faux Greenery: here & here. Lighting: Visual Comfort. 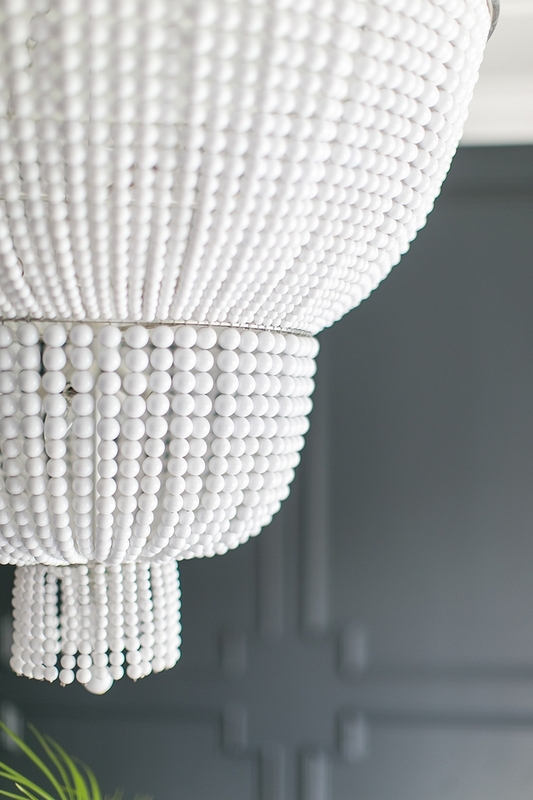 Other Beautfiul Beaded Chandeliers: here, here, here, here & here. 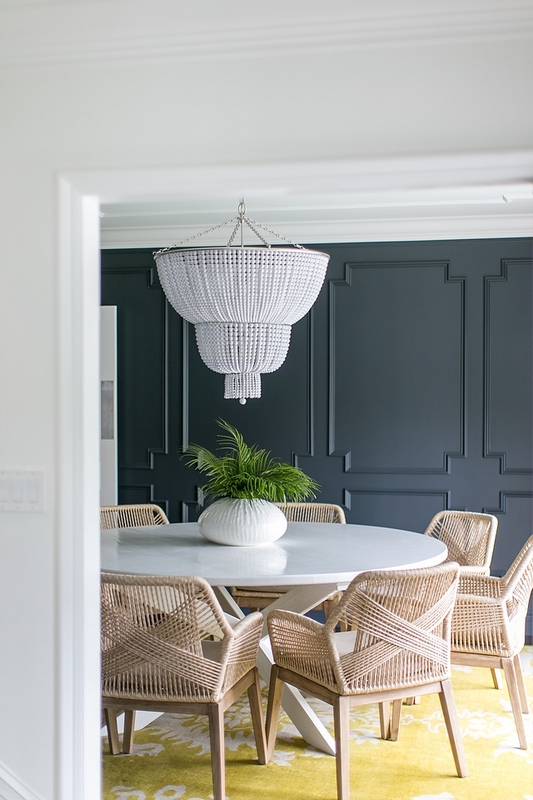 Wainscotting Paint: Sherwin Williams SW 7076 Cyberspace. 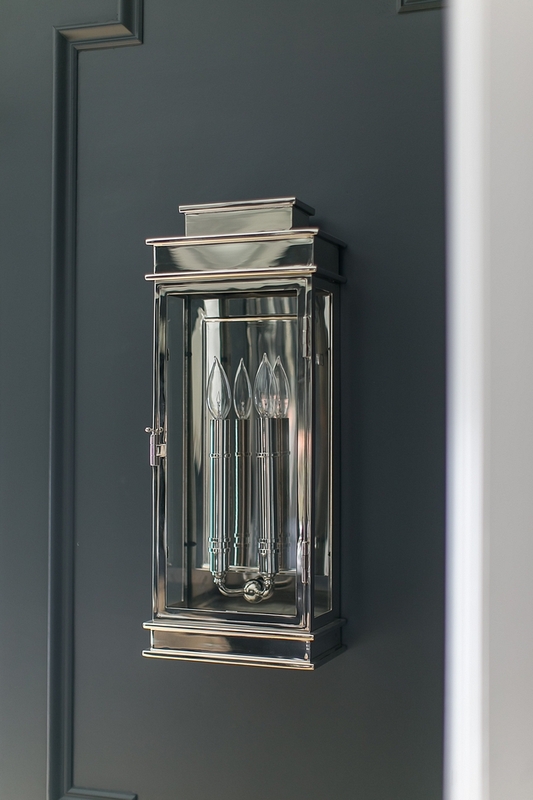 Sconces are by Visual Comfort. Drapery Taping: Schumacher, Nicholson. Color: Citrine. Rug: Custom, Aja – Other Runners: here, here, here, here & here. Art: Wendover Navy 1 & Navy 2 – similar here. 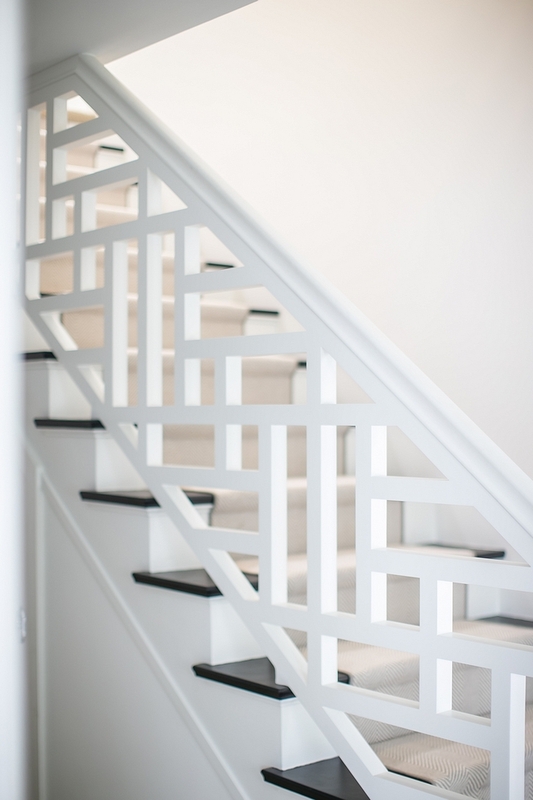 Staircase railing is custom, built by Sherwood Brothers. This grey looks amazing on cabinets! 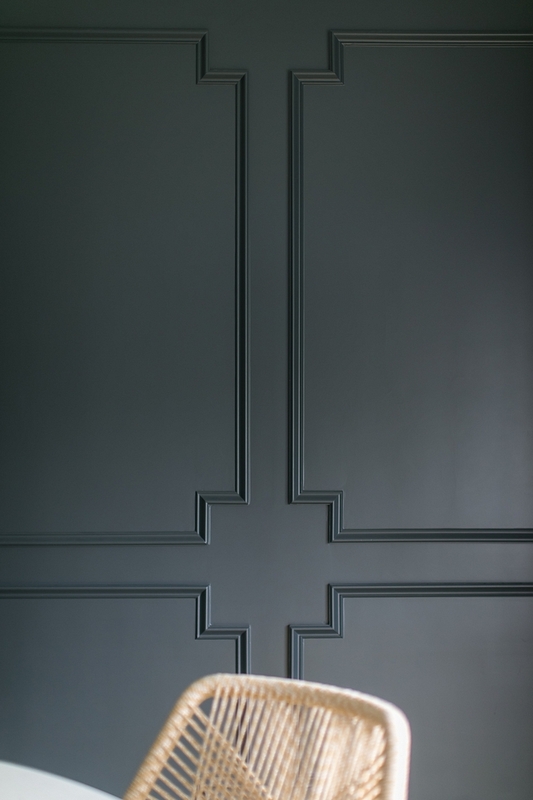 Wet bar paint color is Frazee FR 8642 Foggy London. 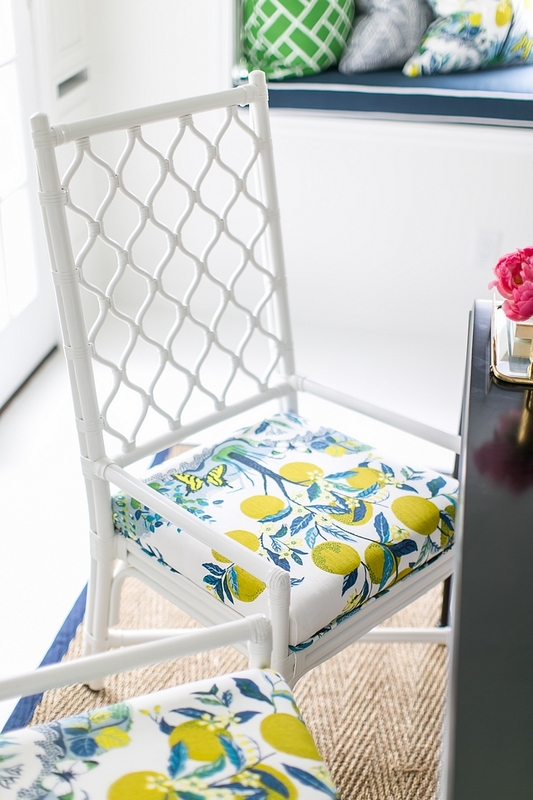 Chairs: Charlotte & Ivy – Similar here. Others: here & here. Pouf: here – Other Beautiful Poufs: here, here, here, here & here – similar. Classic with a twist? I love that! 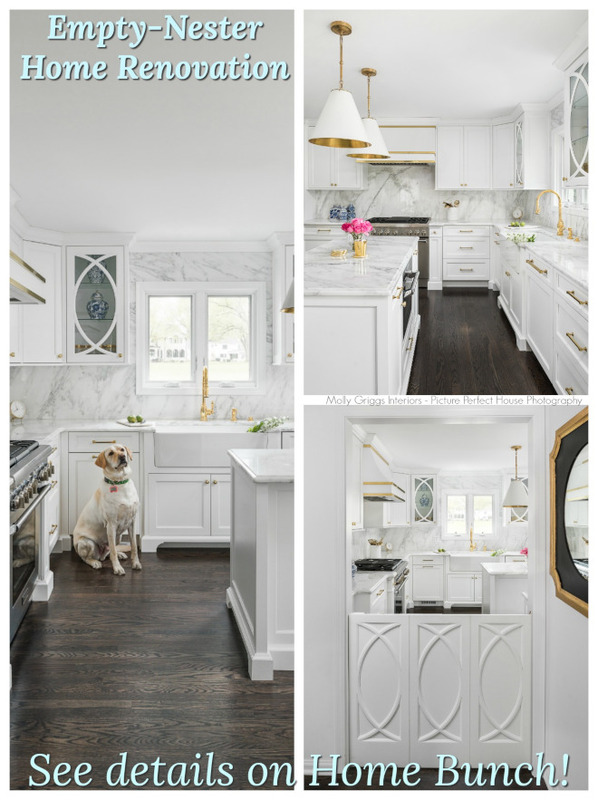 🙂 The kitchen cabinets were existent and painted in Sherwin Williams Pure White. Kitchen Lighting: Visual Comfort – similar here. 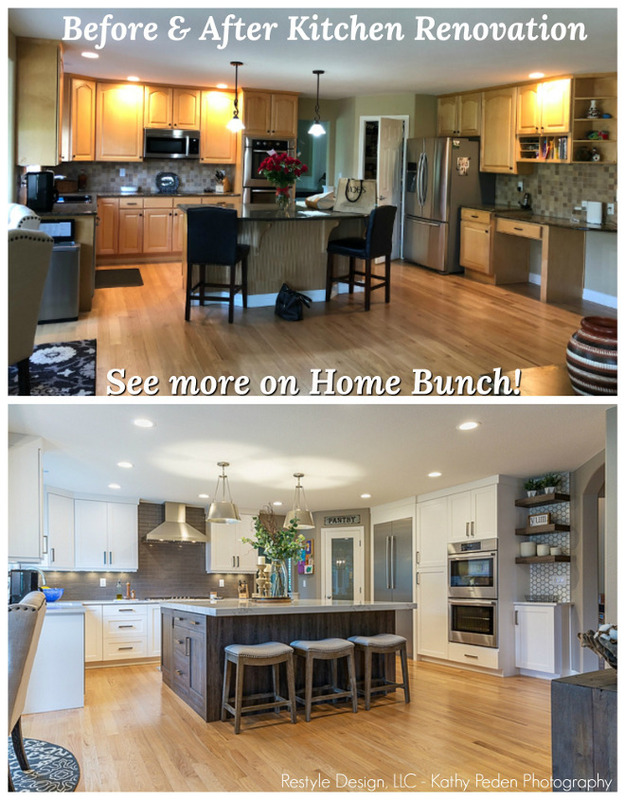 Countertops and Backsplash: Existing – Similar Backsplash Tile: here – Accent Tile: here. Counterstool: RH – Similar: here Other Beautiful Counterstools: here, here, here, here, here & here. Flooring: Existing – similar here. The grey wall paint color is Frazee FR 8642 Foggy London. Chairs and Table: Existing with Nikki Rising Diamond Butti fabric on seats. 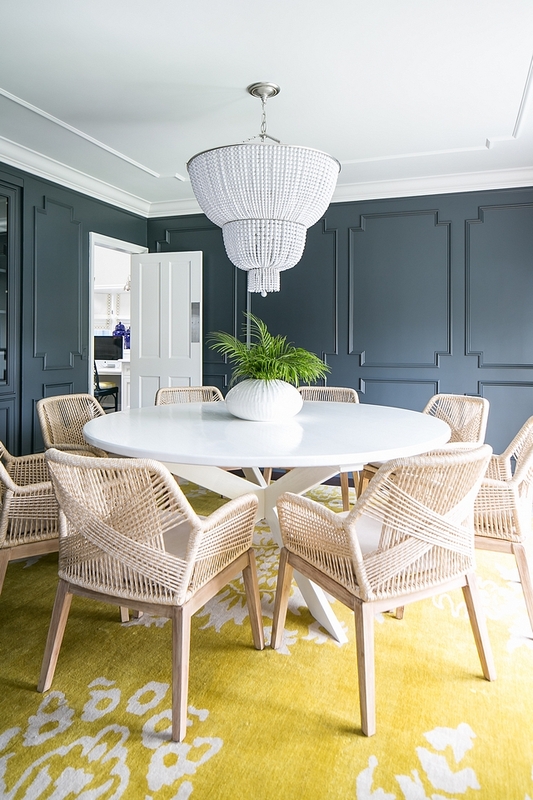 Similar Table: here & here – Similar Dining Chair: here – Other Beautiful Dining Chairs: here, here, here & here. Vase: Crate & Barrel Adra Herringbone Vase. The kitchen opens to a bright family room with high ceilings. Paint color is Sherwin Williams Pure White. Sofa: RH Belgian Track Arm Sofa in Perennial Fog – similar here , here & here (in white). Side Table: RH – similar here. Pillows: Kneadler/Fauriere Pattern: Orbit #2183 Color: Yellow. 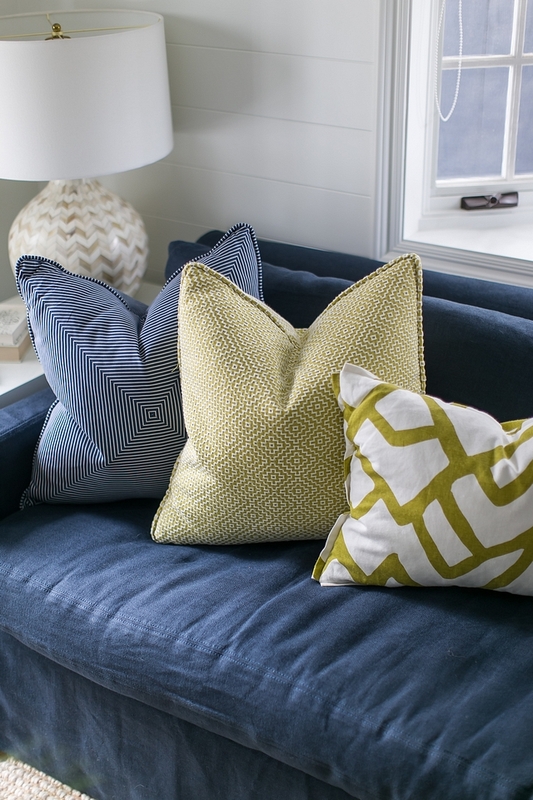 Center Pillow: Quadrille, Villa Velvet. Color: Citron. 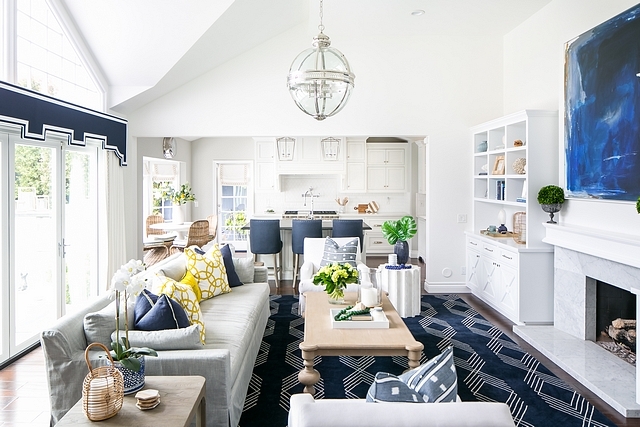 Rug: Aja, custom (available through the designer)- Beautiful Navy Rugs: here (similar), here & here. This gorgeous coffee table is by Noir. Chandelier: RH Victorian Hotel Pendant 24” – similar here (smaller) – Other Beautiful Chandeliers: here, here, here, here, here & here. Chairs: Lee Industries (available through the designer) – similar here & here. 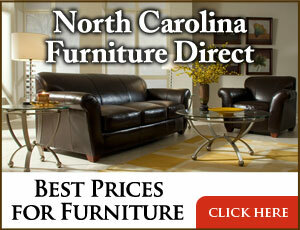 Accent Table: Eloquence Column Side Table – here (coffee table) – similar here. Pillows on chairs: Designers Guild Hadrian. Drapery is custom by Irichka Custom Drapery. Tapping: Taffard. Fabric: Fiona, Color #2. Life is too short to not live with what you love. 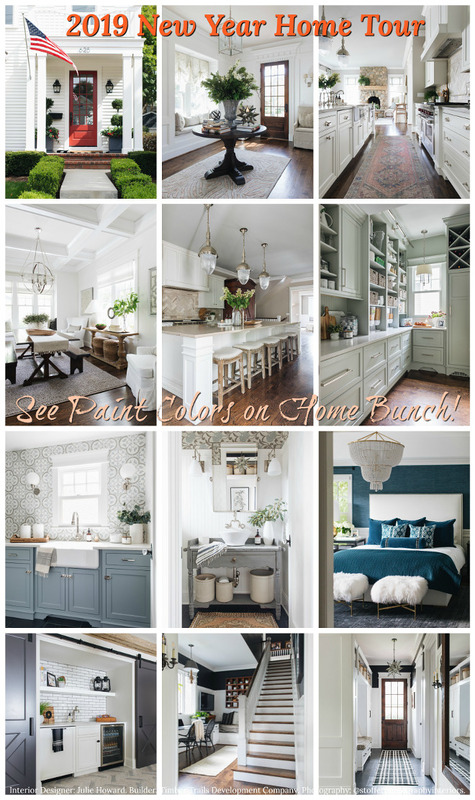 If you love color, embrace it! 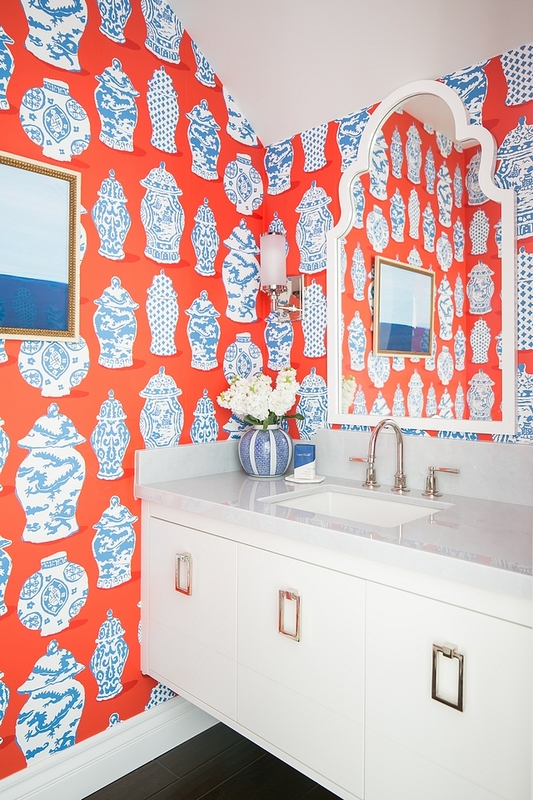 Wallpaper: Stroheim Canton Persimmon by Dana Gibson in Blue. Cabinetry is custom by Bryan Cates. Hardware: LA Hardware 4″ Rectangle Drop Pull PN. Faucet: RH – similar here. This cozy den is perfect to relax at the end of the day. I am loving the color scheme and that comfy sectional. Sofa: Restoration Hardware Belgian Track Arm Sectional in Navy – similar here, here & here. Similar Sofa: here. 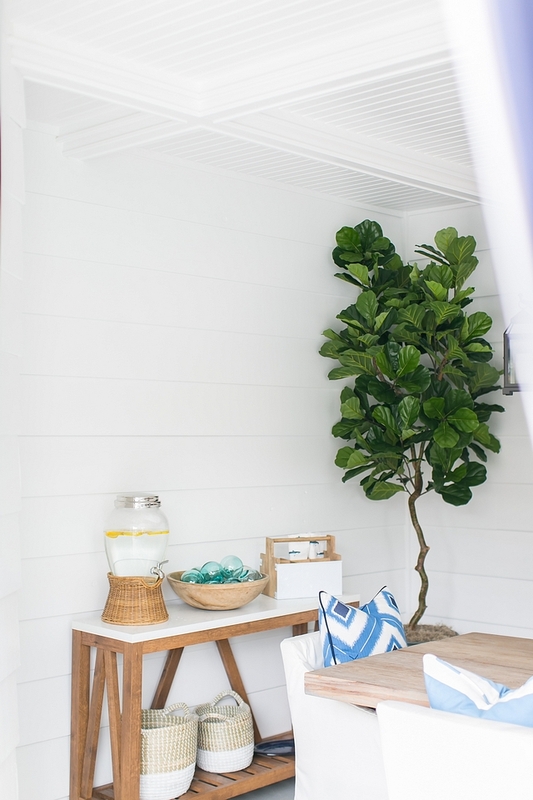 Similar Faux Fiddle Leaf Tree: here. Side Table: Serena and Lily Atelier Nighstand. 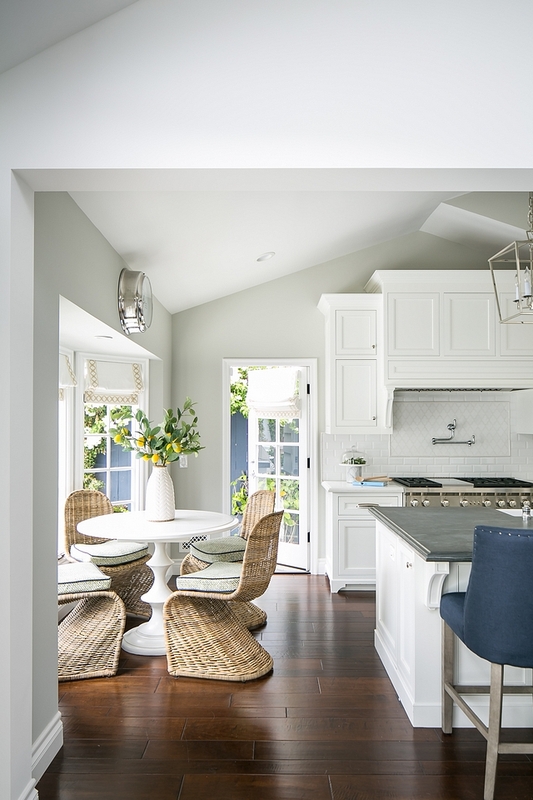 Shiplap Paint Color: Sherwin Williams Pure White SW 7005. Ottoman is custom with Romo Nahli Sunflower fabric – Other Beautiful Ottoman Coffee Tables: here, here, here & here. Lantern: Cotier Conorado – similar here. Drapery: Custom with Romo Fabrics. Rug: here Similar: here & here. The white tray is from West Elm. 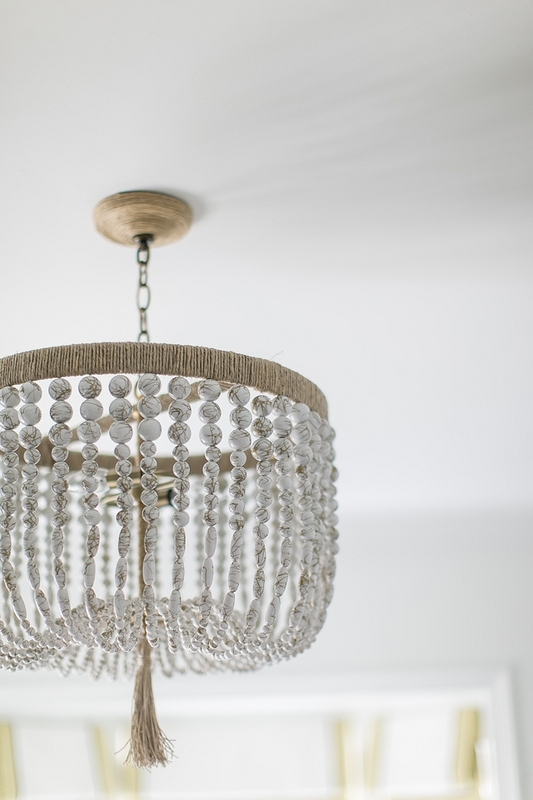 Chandelier: Malibu White Bead Chandelier 18″ – similar here, here, here & here. 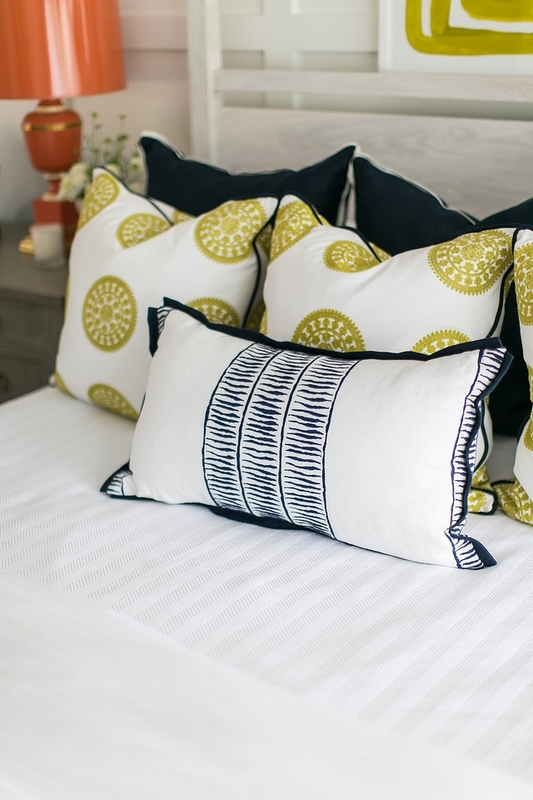 Pillows are Custom – 1st Pillow: Schumacher Zimba (here – in grey). 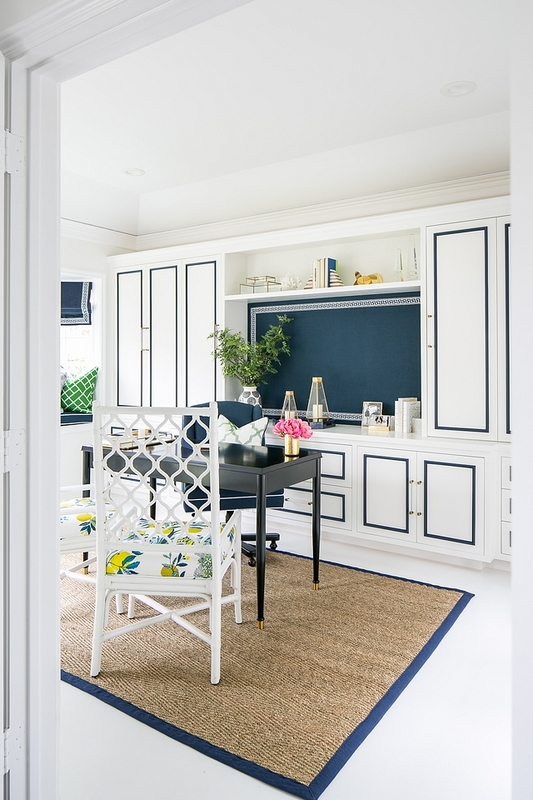 The den opens to a dream office with custom cabinets and painted floors. Desk: William Sonoma Lacourte Writing Desk, Black, 48”. 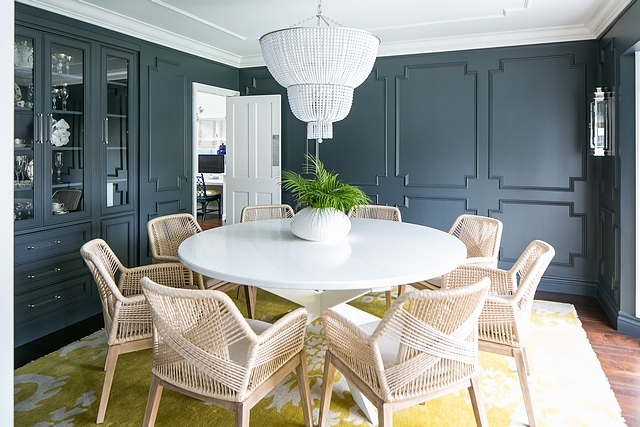 Rug: Sisal Herringbone Rug by AGK. Side Chairs: Selamat Ambrose Armchair in White. The custom seat fabric is Schumacher Citrus Garden. 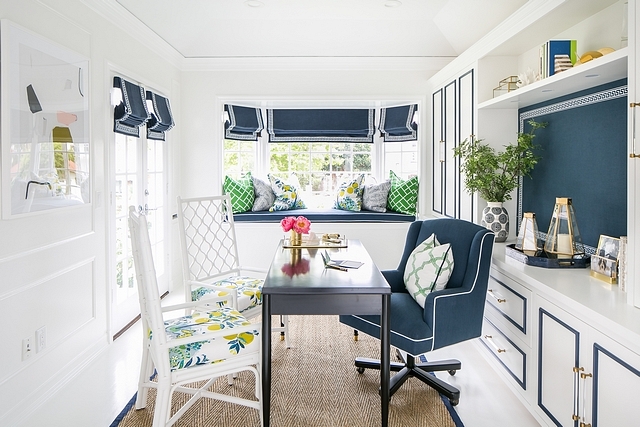 This home office also featuring an inviting window-seat with beautiful pillows. Window-Seat Pillows: Schumacher Citrus Garden. Green Pillow: Jonathan Adler Postino. 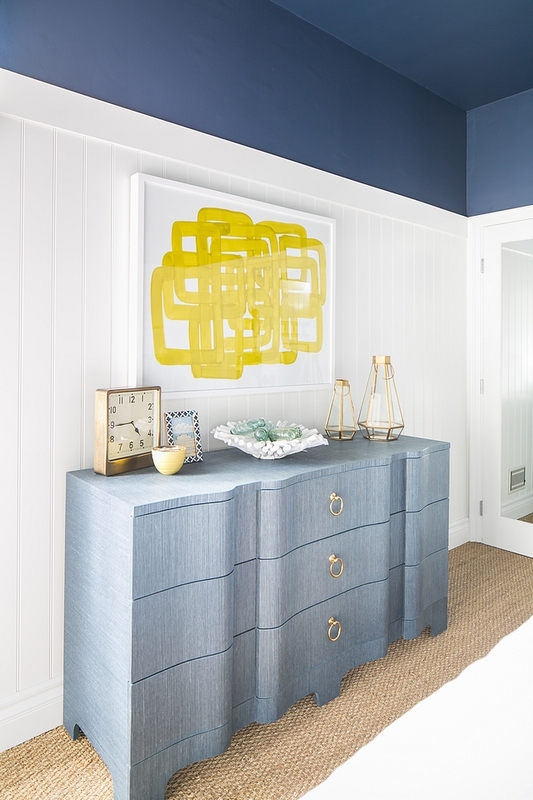 Paint color above wainscottingh is Sherwin Williams SW 6244 Naval and wainscotting is SW Pure White. Nightstand: Bungalow 5 – Others: here, here & here. Accessories: West Elm & Two’s Company. Bedding: Serena & Lily, including lumbar pillow. 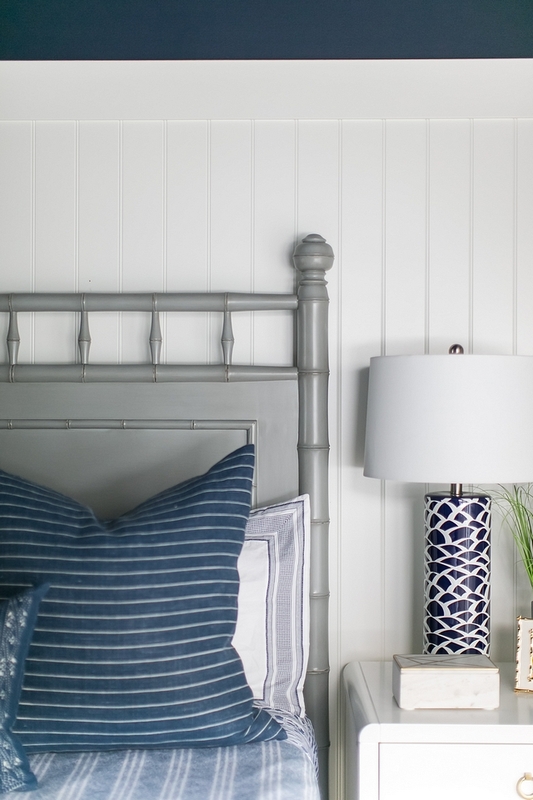 Bed Frame: Redford House French Gray – similar here & here. This is one of my favorite dressers. I love the serpentine shape and the grasscloth finish. 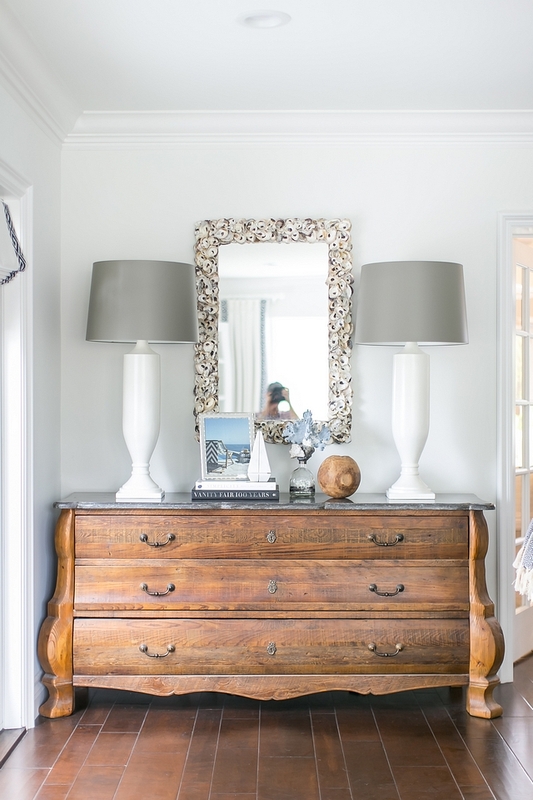 Dresser: Bungalow 5 – similar here & here. Art: Wendover – available through the designer. The master bedroom is yet another outstanding room! 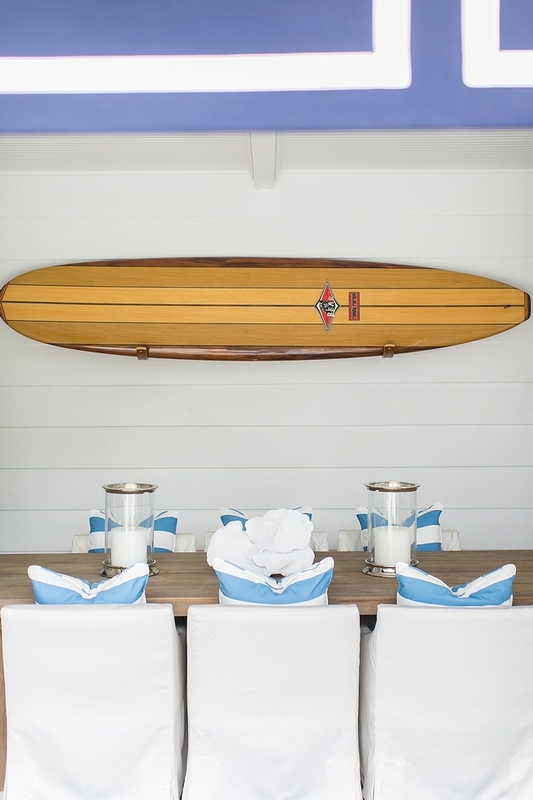 Notice the grid board and batten accent wall. Rug: Aja, custom – available through the designer – Others:here, here, here, here, here, here, here & here. Bed: Poster Bed Washed Oak – King. Pillows are custom. Fabric: Schumacher Nicholson, Citrine. Designer’s Guild Williams Yeoward, Kravet 33042/323 22” pillow. Paint color is Sherwin Williams SW 7005. 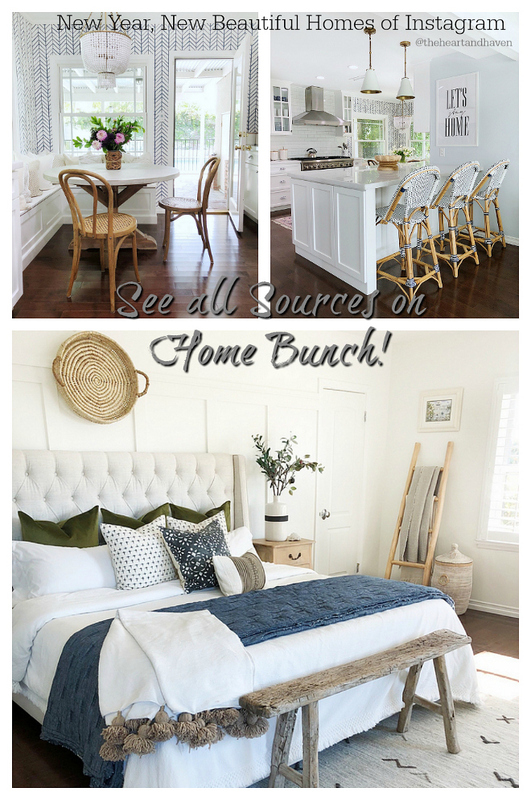 Settee: CR-Laine – Others: here, here, here, here & here. 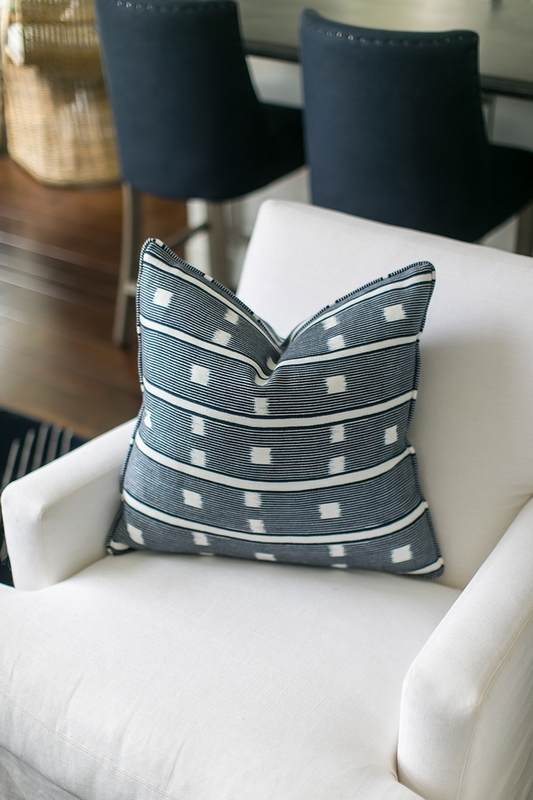 Settee Pillow: Schumacher Allen Vicarage, Navy. Nightstand: Wisteria Modern Gustavian Chest in Grey. Orange Table Lamp: Robert Abbey Mary MacDonald Table Lamp. This sitting area couldn’t be any better. Chairs are Eloquence Scadinavian Bergere in white linen and warm oak finish. 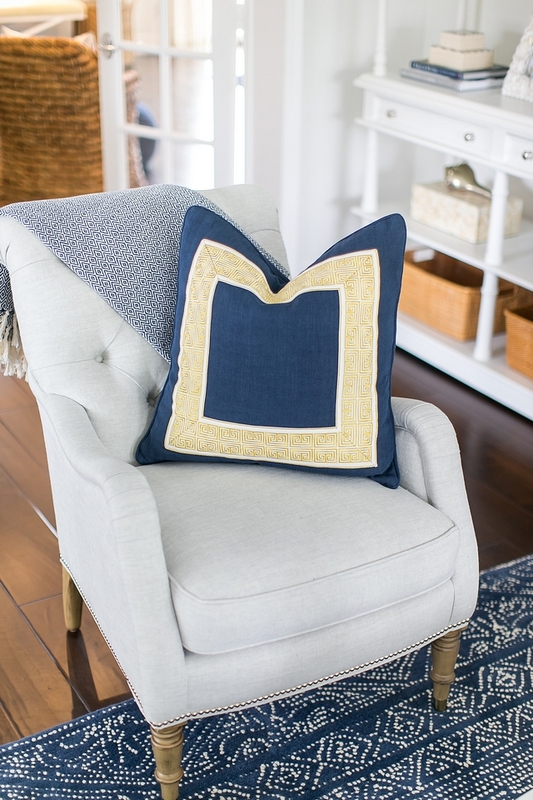 Other Beautiful Accent Chairs: here & here. 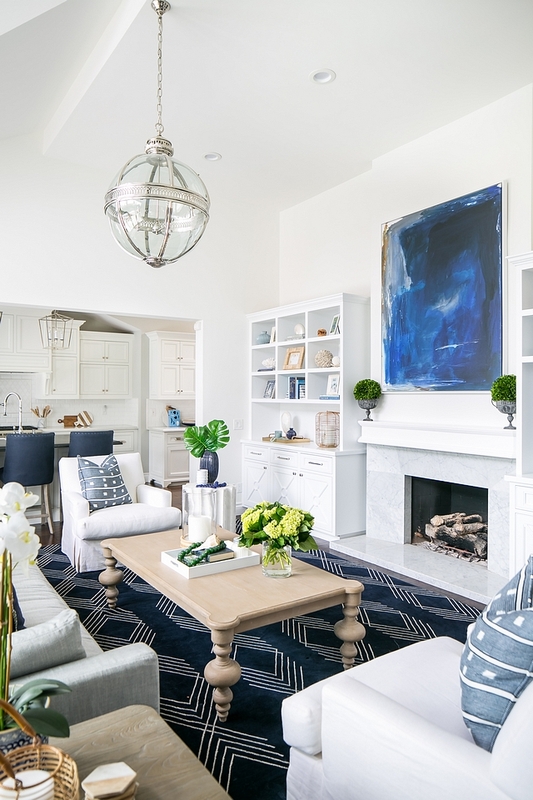 Chandelier: Ro Sham Beaux Malibu Navy Agate Chandelier. Blue and white never looked so good! 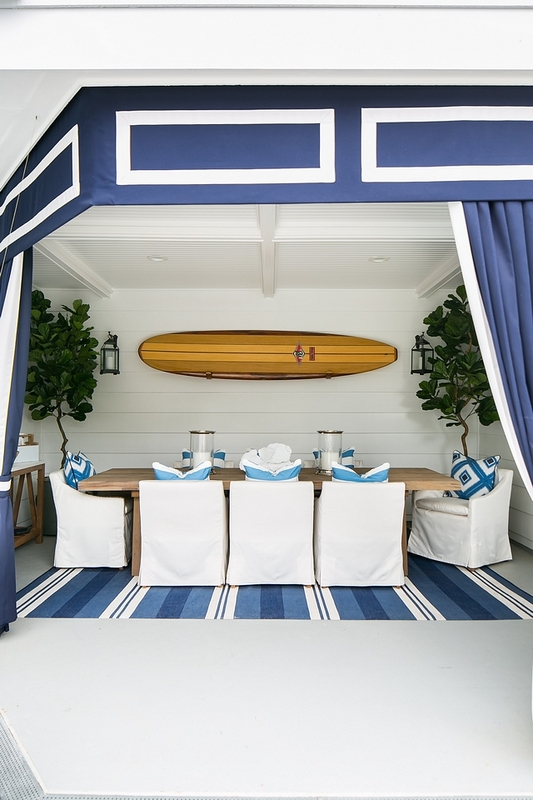 I am in love with these custom outdoor draperies. 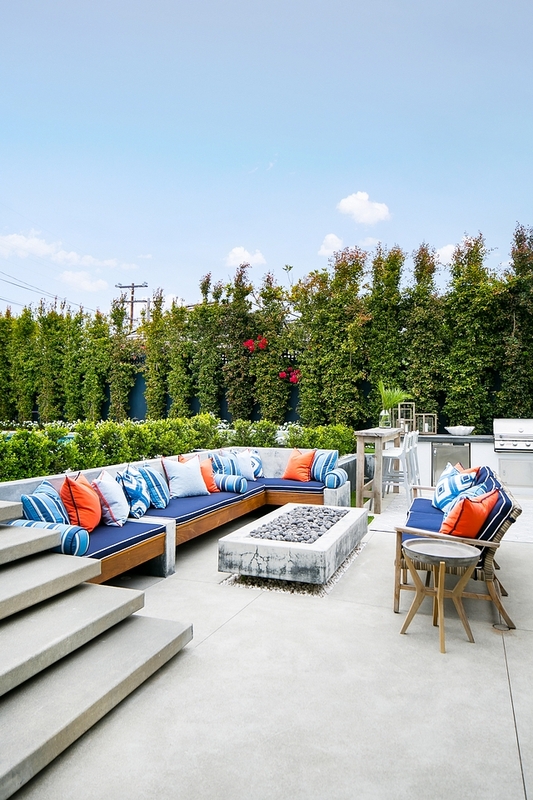 They add elegance and privacy to the outdoor dining area. 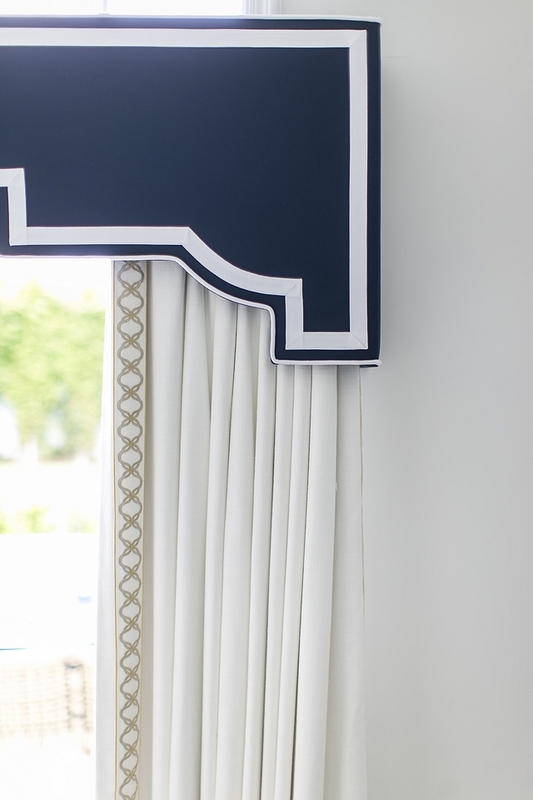 Drapery: Custom with Sunbrella Navy Blue & White. Beautiful Outdoor Dining Tables: here, here, here, here & here. Surfboard is from “Bird Surfboards”. Beautful Outdoor Console Tables: here & here. 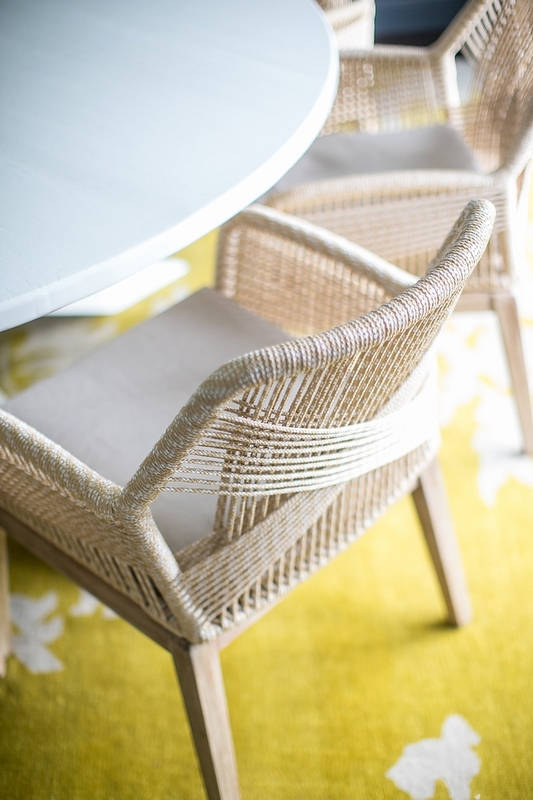 The outdoor dining chairs are RH Belgian Linen Slope Arm Chair slipcovered in Sunbrella White. 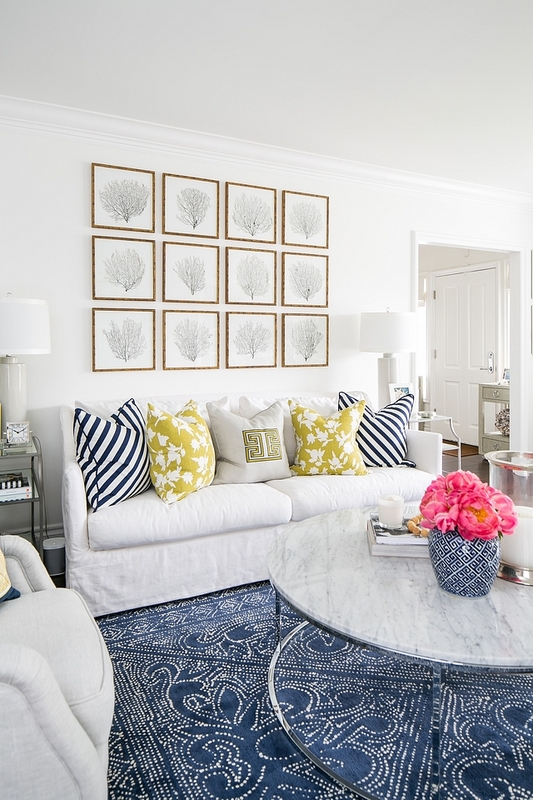 Pillows on white chairs: Thibaut Delray Diamond. 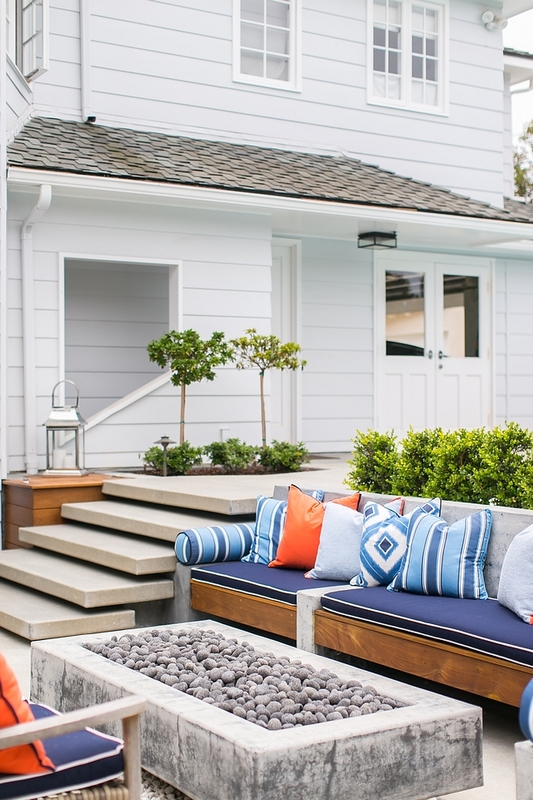 The lounge area features concrete with wood trim built-in sofas and a concrete firepit. 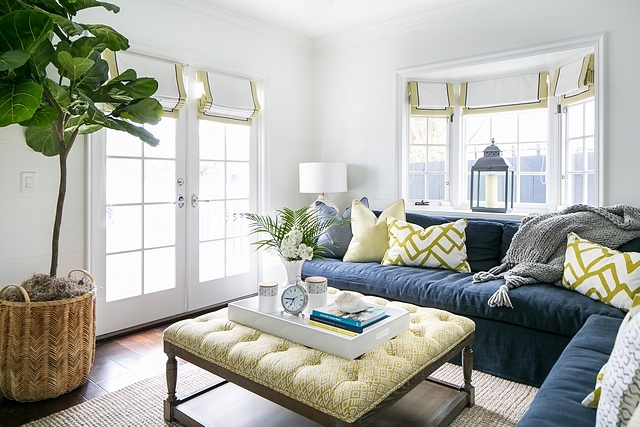 Pillows on Sofa: Sunbrella – similar here & here. 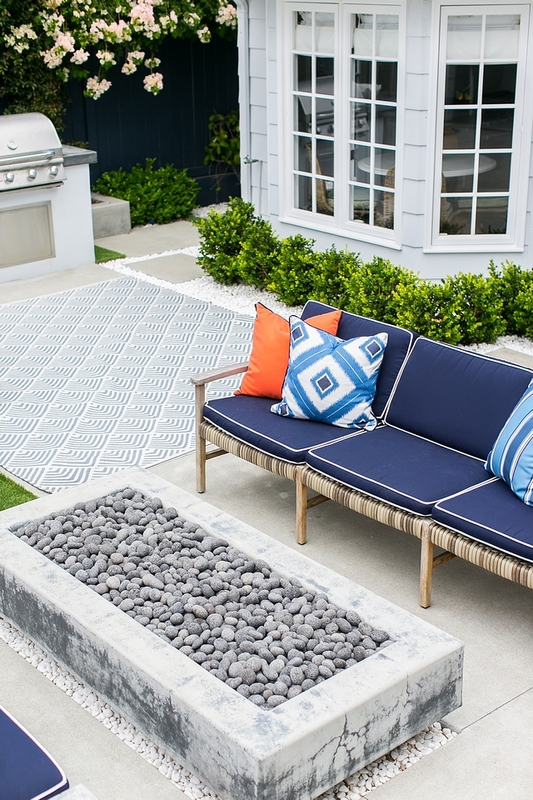 Patio cushions: Stark Westbury, Navy – Custom-made by Irichka Custom Draperies. This entire space is perfect for entertaining. Notice the outdoor kitchen area. 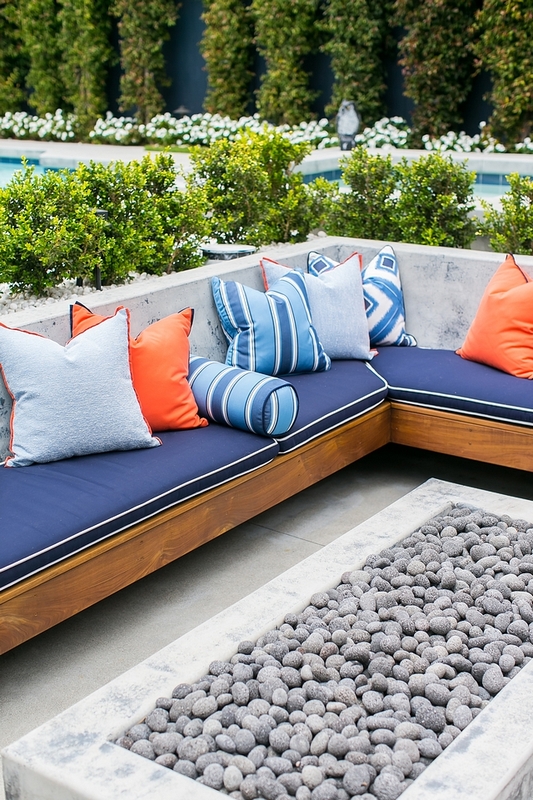 Beautiful Outdoor Lounge Furniture: here, here, here & here. 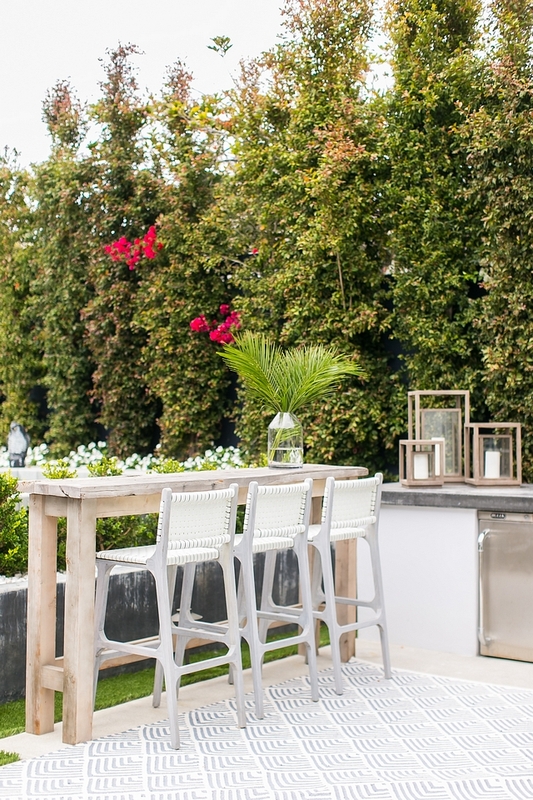 You don’t need to spend too much money to have an outdoor bar. This bar table could be an easy DIY and you just need to add a few outdoor barstools and an outdoor rug. Bar chairs: Made Goods Rawley Barstool – Others: here & here. Table: Custom – Similar Outdoor Bar Table: here. Rug: Dash & Albert (neutral color). 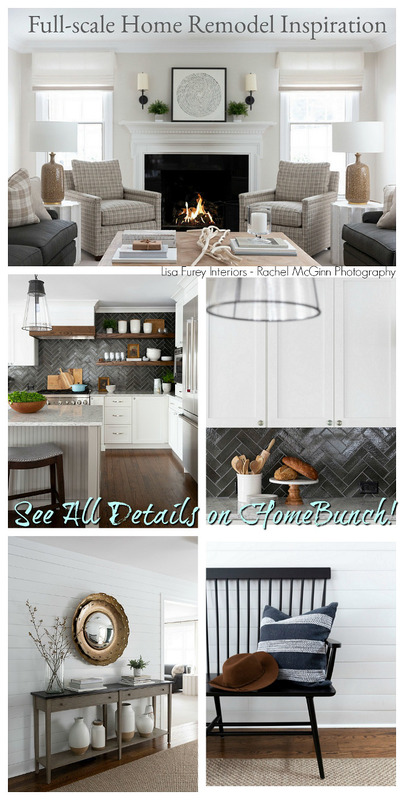 Many thanks to the interior designer for sharing all of the details above! Interior Design: AGK Design Studio (Instagram). 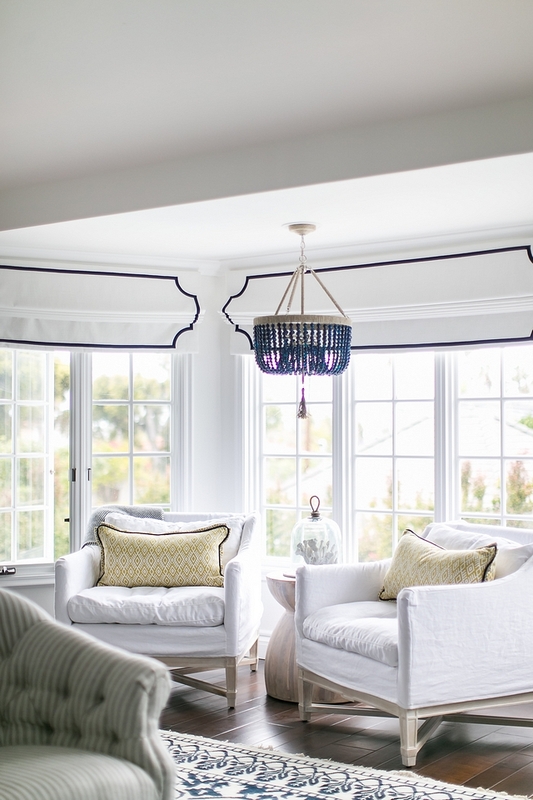 All window treatments, custom bedding, custom pillows and cushions were done by @irichka_custom_draperies.